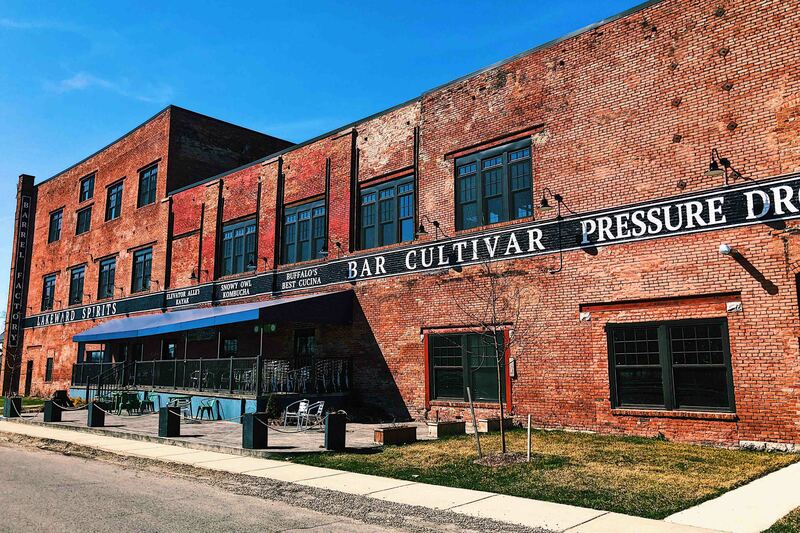 One of the best examples of Buffalo’s rebirth can be found in the shadow of the grain silos in the city’s Old First Ward, at The Barrel Factory. This repurposed industrial space that originally opened in 1903 and produced barrels as the Quaker City Cooperage Co. has never looked better, becoming a new hotspot while maintaining a respect bordering on reverence for the building’s extensive history. The Barrel Factory’s developers restored the original factory floors for the second floor event space, and used reclaimed wood and other original materials from the building for its redevelopment. 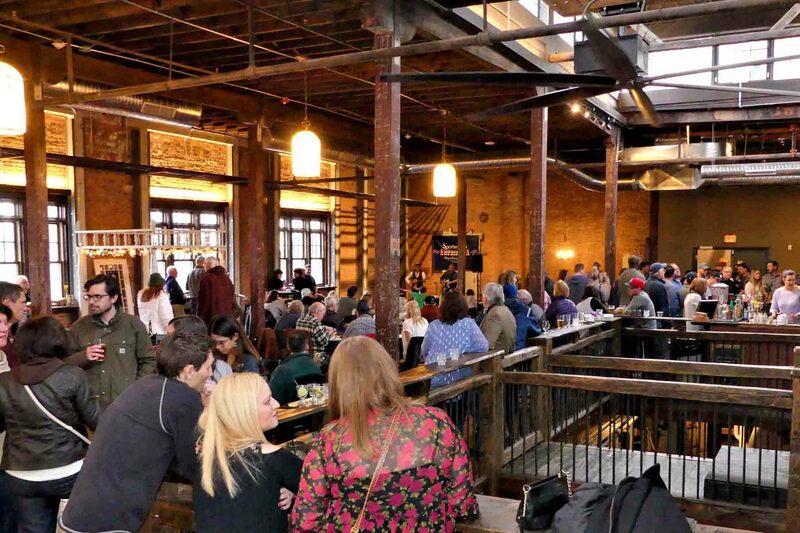 Whether you’re in the mood for a kayak jaunt among the grain elevators, sipping on a craft cocktail, beer or kombucha, tasting hard ciders, or grabbing a bite to eat, The Barrel Factory should be your first destination. The facility has lots of comfortable open seating and is open Thursdays 5-10 p.m.; Fridays 3-11 p.m.; Saturdays noon-11 p.m.; and Sundays noon-5 p.m. Wednesdays may be added to the schedule as the spring and summer go on. Check out a run-down of The Barrel Factory’s offerings below! 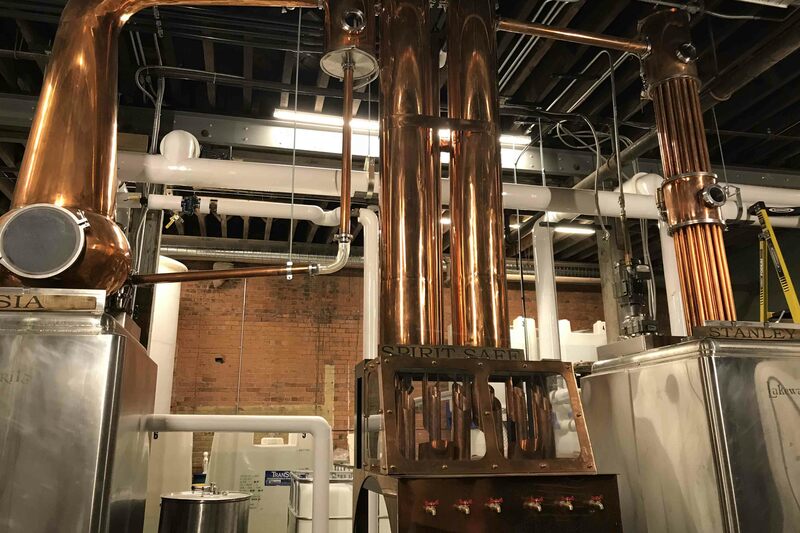 Lakeward Spirits: This homegrown operation, the anchor of the entire facility, currently produces vodka, two different gins and white rum, while a barrel-aged, amber rum will be available in late summer. Also coming soon: in-depth operations tours for distilling enthusiasts. Lakeward shares a tasting and bar area with Pressure Drop Brewing. Pressure Drop Brewing: Looking for some scrumptious IPAs or ales to tempt your palate? Head to Pressure Drop Brewing. The brewery has all its operations at The Barrel Factory, along with 10 or so selections on tap at the bar. Pressure Drop creations can also be found on tap at bars and restaurants all over Western New York and beyond. 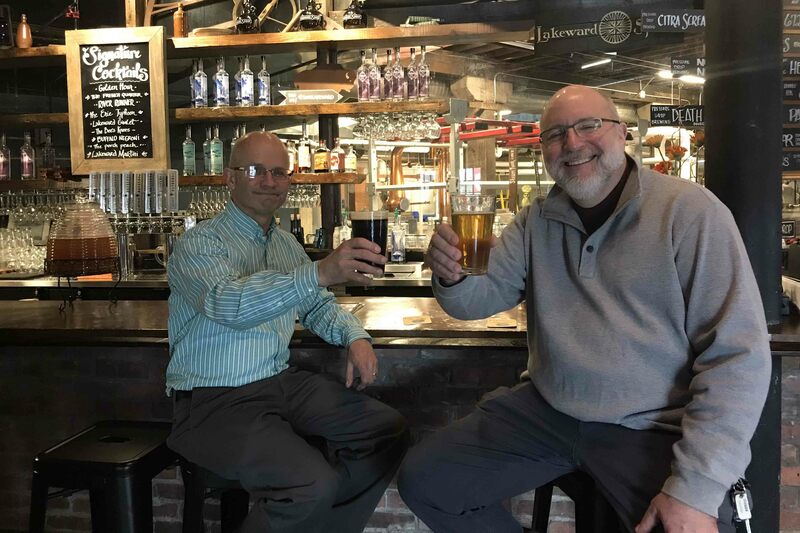 Head brewer/CEO Karl Kolbe is also collaborating on a new IPA with Clarence’s West Shore Brewing. 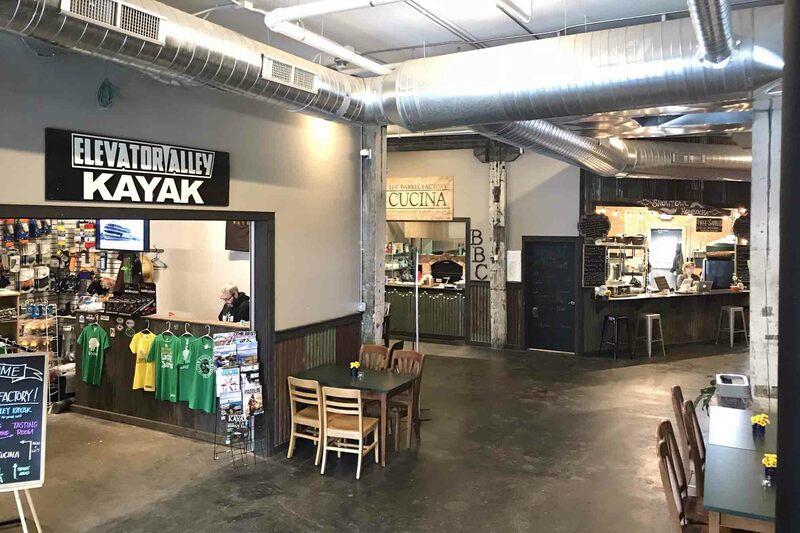 Elevator Alley Kayak: This distinctly Buffalo business offers kayak rentals, tours and lessons, as well as kayak, canoe, paddleboard and accessory sales. The shop is just yards from the Buffalo River and Mutual Riverfront Park kayak launch. Snowy Owl Kombucha: Fermented tea might sound odd to the uninitiated, but kombucha is a delicious beverage choice that boasts probiotic and antioxidant powers. Snowy Owl does it right, using fair trade, certified organic teas and organic local produce to create its kombucha offerings. Flavors include yummy combinations like tart cherry coconut, lemon ginger, spiced cider and strawberry lemonade. Growler fillings and free tastings are part of the deal, as well. Buffalo’s Best Cucina: Buffalo’s Best Grill now has an Old First Ward location in the Buffalo’s Best Cucina at The Barrel Factory. Featuring a walk-up counter for ordering, the restaurant’s rotating menu includes items such as a charcuterie platter, beer mussels, mac and cheese, artisan pizzas, paninis and salads. Guests can enjoy their food in the comfortable Barrel Factory lobby area or take it up to the tasting room. Bar Cultivar: Leonard Oakes Estate Winery of Medina is opening Bar Cultivar, a cider-focused bar and tasting room, by this summer. It will also serve Leonard Oakes wine. Patio seating: Once the weather is in full summer mode, The Barrel Factory will feature patio and outdoor seating all along Republic Street, facing the railroad tracks and the Buffalo River. It’ll be a perfect place to enjoy a cold brew—whether that means beer, wine, cider, kombucha or spirits—and a relaxing bite to eat. Event space: The Barrel Factory’s event space is already booked with weddings throughout the summer, each of which will get to enjoy a new, private outside deck area and large floor cutouts overlooking the custom-made, copper distillery stills and piping in the basement. 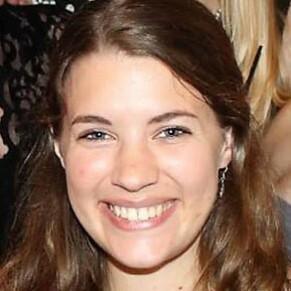 Kristy Kibler is a lifelong Western New Yorker, proud St. Bonaventure grad and former journalist who now works in the Communications Office at Trocaire College.